The BlackBerry Curve 9360 is a great device for the cash-strapped. Flat rate BlackBerry Internet Service (BIS) allows users to enjoy smartphone perks, like instant messaging, e-mail, social networking and Internet browsing, at a fixed monthly rate. The Curve 9360 is a petite device that slips easily into pockets and sits comfortably in the user's hand. The phone has hard black plastic and metallic finishes, with the line's signature curved edges. The phone is light, and despite its low cost, has an incredibly elegant design. Power and audio inputs are well positioned on the left and top of the phone. Volume buttons and a shortcut to the camera are placed on the right-hand side, making it easy for users to adjust the volume during a call, while providing quick access to the camera. There is also a lock button on the top of the phone. I found this incredibly useful, compared to phones that require users to perform a sequence of key inputs to unlock the phone. The Curve 9360 runs on BlackBerry OS 7.0. The interface is fairly user-friendly. Using the scroll pad, users can effortlessly flip through menu panels. These panels sort apps into all, frequently used, downloads and media categories. Users can also customise a 'favourites' panel with their preferred apps and can position these apps in the different panels. I found this useful, because it let me keep my most-used apps on the top. Making calls is easy by simply selecting a contact from the contacts list, or typing the number in with the keyboard. Call quality was also great, provided I had reception. The Curve 9360 runs on an 800MHz single-core chip processor. While this is a far cry from the dual-core processors available in some models, this is adequate at the Curve's price point. In any event, 800MHz is more than adequate to run the phone's apps, which loaded in no time. The phone comes with 512MB of storage, which is adequate for running the preloaded apps and storing some extra apps, music files and photos. However, most users will need to use the DS card slot to bump up their storage. The screen is fairly small, measuring 62mm diagonally, so it's not great for watching videos or even browsing photos. However, the space is adequate to display the phone's apps, and users won't need to strain their eyes to read messages. The screen itself has a 480x360-pixel display, presenting clear and colourful images. I found it managed definition well, displaying fairly sharp edges and delivering excellent colour, contrast and detail. The 9360 is 3G- WiFi- and Bluetooth-enabled and has an HTML browser. According to Research In Motion, it handles data at speeds of 7.2Mbps. On 3G, I found pages took a few seconds to open, but when trying to access complex Web pages, the phone was prone to hanging. I found these time lags frustrating at times, so that while the browser itself is user-friendly, I would not recommend using the Curve 9360 for heavy browsing. Then again, with a 800MHz processor, slow browsing speeds are hardly surprising. A further drawback to browsing is the lack of a touch-screen, which means users have to manually zoom in and out of Web pages. 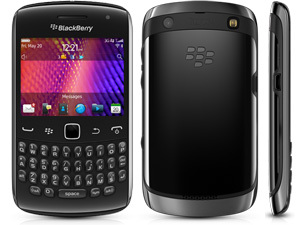 The 9360 comes with social media apps, like Facebook and Twitter, and users can receive e-mails from numerous accounts on their BlackBerry device. I found the Facebook and Twitter apps were great. Users can set the update intervals and also refresh feeds and I found feeds were almost instantaneous. What's more, my Gmail e-mails came through on my phone before they updated on my office PC (which updates mails immediately). Not too shabby, hey? The 9360 is also near field communications-enabled. This means users can transfer files between the phone and other NFC-enabled devices by tapping the two together. The Curve 9360 comes with a 5MP camera. While happy snappers will be disappointed at this, users of some older models will be happy to have a flash. In fairness, the camera takes adequate photos, provided users aren't planning on printing them out much larger than the standard 10x15cm. The camera also comes with some cool features like face detection to help amateur photographers along. However, the camera did have a tendency to over-saturate colours. Then again, given that BlackBerry users have to make do without Instagram for the moment, some might welcome this shortcoming. Aside from the Facebook and Twitter apps, users will also find IM apps for BBM, Google Talk, Yahoo Messenger and Windows Live Messenger. Of course, BBM knocks the socks off most IM apps, coming second to Whatsapp only because of the wide user base Whatsapp boasts, thanks to it being device-agnostic. There is also a shortcut to BlackBerry App World, which has a great search engine and also sorts apps according to themes, games and free apps. I was unhappy with the native Maps app, but after downloading AfriGIS Navigator free from BlackBerry App World, I was good to go. The Curve's battery lasts a good day, even under heavy usage. Moreover, it charges up in just under two hours. The BlackBerry Curve 9360 is the perfect phone for people who use their phones primarily to communicate. It handles calling well and comes loaded with IM and social media apps. The phone also offers a 5MP camera with a flash, and it's a stylish little thing, too. While the Curve falls behind most high-end smartphones in terms of features, it offers great value for money.